In early 2010 construction began on phase II of the Nautilus – Slug Catcher Expansion project. This project consisted of installing 3,500′ of 48″ pipe which would expand their liquid storage capacity by 5,000 barrels, doubling their previous storage capacity. Portland Bolt was called upon to supply over 300 – 1-1/4″ and 2″ diameter galvanized F1554 Grade 36 anchor bolt assemblies that would be used for the expansion. 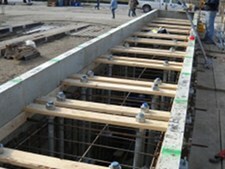 The 2″ diameter anchor bolt assemblies consisted of 1-3/8″ thick x 6-1/2″ square base plates that were assembled and welded in place before galvanizing. Portland Bolt was able to manufacture this material in just 7 working days and have it delivered to the jobsite on schedule. With our quick turnaround and on time delivery we were able to help the contractor deliver this job ahead of schedule and within budget.